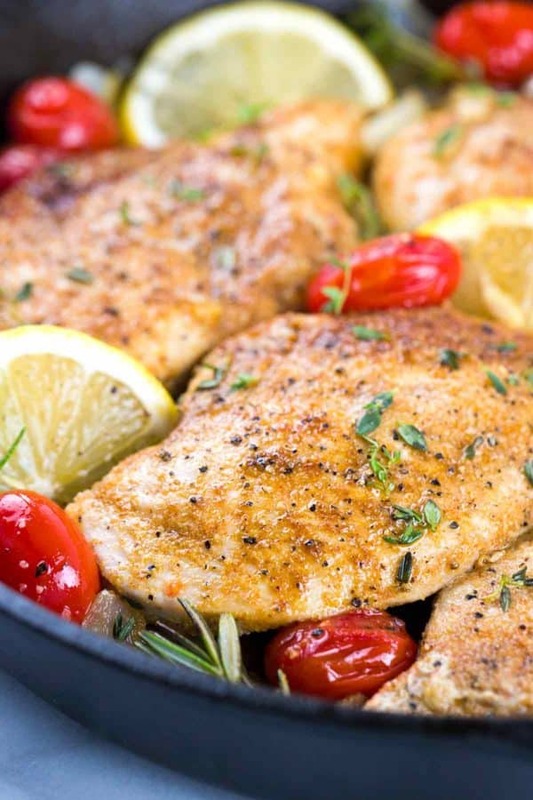 Moroccan lemon chicken made in one pan with fresh herbs and blistered tomatoes. The Mediterranean spices add wonderful color and robust flavors to each bite. This Moroccan lemon chicken recipe is easy to make and healthy. During those busy weekdays, I struggle with finding the time to create a wholesome meal for my family. Thankfully this Mediterranean-inspired recipe is quickly prepared in under 20 minutes and with minimal clean up afterward. All the ingredients and spices come together in my cast iron pan. This North African dish usually is cooked with green olives and that’s certainly something you can add, however, I chose to slightly tweak the recipe and omit olives this time. So if you’re ready to fill your kitchen with delightful aromas, let’s get sizzling! One of the biggest challenges when cooking protein is the dreaded dry texture. Here are a few ways to avoid dry chicken when preparing on the stovetop. Make the thickness of the pieces as uniform as possible to ensure even cooking. You can slice the breast through the center to create two thinner slices if needed, or you can pound the chicken out to a smaller piece. When sauteing, make sure the heat is just high enough so the oil is hot but not smoking, and I have an even layer of oil in the pan. Saute each side of the chicken until golden brown, then turn down the heat and check the temperature at the thickest part with a calibrated digital thermometer. This reading gives a gauge on how much more time is needed to cook. The chicken breast is done when the temperature reaches 160 to 165°F. I always stock my pantry with essential spices such as garlic, cumin, coriander, and paprika, so I can make a quick spice blend to add flavor to my proteins, and the best part is you do not need to marinate for hours! These spices along with a dash of fresh garlic, onions, rosemary, thyme, lemon, and olive oil give a nice Middle Eastern flavor to this chicken recipe. By lightly sauteing the onions and garlic in the olive oil first, this allows the caramelized flavors to infuse into the spiced chicken, and the lemon juice helps to tenderize and brighten the dish. This Moroccan lemon chicken recipe can be served with your favorite sides or on top of a salad. I like to make fresh hummus, served with a side of spinach salad and fresh vegetables. My cranberry almond quinoa recipe also complements this dish as it takes just about the same amount of time to cook chicken, so they will be ready to serve and enjoy together! Meats have “carry-over cooking” once removed from the pan, so I like to remove the chicken when it reaches about 160°F, then allow the meat to rest at room temperature for 5 to 10 minutes to reach 165°F before serving. This way I know my chicken is cooked and still juicy, but most importantly safe to eat! In a small bowl, combine the spice mix; cumin, coriander, onion powder, garlic, paprika, pepper, and salt. Set aside. Evenly coat both sides of the chicken breast with a ½ teaspoon of the spice mix on each side (1 teaspoon total). Add ¼ cup olive oil to a large sauté pan and heat oil over medium-high heat. Add the sliced onions and garlic, and sauté for 2 minutes, stirring continuously, move to the side of the pan. Add tomatoes and cook until blistered, about 3 minutes, then transfer to a bowl. Place the four pieces of chicken in the center of the pan. Add the sprigs of rosemary and thyme into the pan so the flavor of the herbs infuse into the cooking oil. Sauté the chicken breasts for 4 minutes, until the surface is nicely browned. Lower heat to medium, flip over each piece of chicken and cook for 4 to 5 minutes, or until the temperature reaches 160F - 165°F. Turn off the heat and squeeze half of a whole lemon over the chicken in the pan. Remove the chicken from the pan and serve with your favorite sides. MAKE IT WHOLE30: Use extra-virgin olive oil, and use sea salt for kosher salt. This looks wonderful! When you say “1/4 extra virgin olive oil” in the ingredients list, do you mean 1/4 cup? That’s what it says in the instructions, but that seems like a ton of oil! Hi Angie- Thank you so much for catching the recipe error! Yes, it’s 1/4 cup of extra virgin olive oil. You can certainly add less, the best is to gauge the size of your pan and make sure the both is evenly coated with the oil. You want enough oil to saute the onions and the chicken. I love cooking in my cast iron. Everything just seems to taste better! I actually like that you left out the green olives. I know you said this dish is North African so would it be totally off the wall and weird if I added capers in place of the green Olives? I know that’s more Italy and France… but I just love capers with chicken lol. I love using my cast iron too Benny! I was just thinking of purchasing an even larger size, haha. I actually was playing around with substituting olives for capers, so I don’t see why you can’t do the reverse. They both have that acidic and pungent taste, so think that would work well! I live and die by my instant read, digital thermometer. It’s made my chicken so much better 🙂 Love the spice blend in this recipe! I couldn’t agree more! I get all frantic when I can’t find it, haha. It’s definitely key to preventing dried chicken! Enjoy the spice blend! I have all the ingredients which is really nice. Just printed and ready to thaw some chicken breasts and make this. 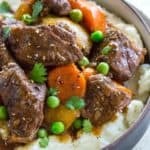 Thanks for more great recipes. There isn’t one that I don’t want to try on the Roundup: ten Whole30 recipes. They fit in quite well with my FITera plan too. Happy New Year Jessica and your sweet, growing family. This was absolutely fantastic. The tips on cooking the chicken to keep it moist we’re great. I have been doing meal prep where I pre-measure ingredients where appropriate so I pull out a container that has everything that is needed. This is a perfect recipe for this. Just like a meal delivery service at half the price!